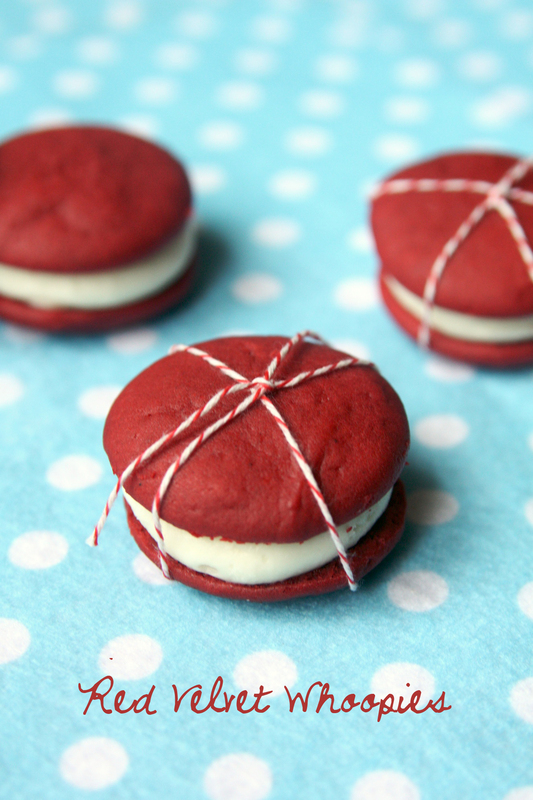 These might be some of my favorite whoopie pies, somewhere up there with the Samoa and German Chocolate Whoopies. I absolutely love how bright they are (nevermind the whole red food coloring thing). They are perfect for Valentine’s day, you’re gonna love them! Transfer the batter to a pastry bag fitted with a large plain round tip. Pipe the batter onto the parchment paper. Bake 7-9 minutes or until the tops are set, rotating the baking sheets halfway through. Allow the cookies to cool on the baking sheets at least 10 minutes, until they can be easily transferred to a cooling rack. Repeat with any remaining batter. Allow cookies to cool completely before proceeding. Cream together cream cheese and butter. Beat in vanilla. On low speed, add confectioners sugar a little at a time. Once all sugar has been added increase to medium speed until frosting is creamy. Spoon the frosting into a decorators bag. Pipe out onto whoopie and sandwich between cookies. Enjoy. This entry was posted in Whoopies. Bookmark the permalink. So glad you enjoyed these!